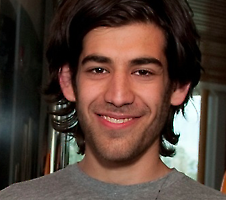 Several pieces about the recently deceased Aaron Swartz. Sasha Costanza-Chock is joining the faculty of the Comparative Media Studies program at MIT as Assistant Professor of Civic Media, and is one of the three principal investigators (along with Ethan Zuckerman and Mitchel Resnick) of the Center for Civic Media. He caught up with his new colleague Ethan Zuckerman to talk about his background and his plans at MIT.